Autobiplan Warchalowski System Type I and Type II. The most successful and active among the Polish aviation engineers before 1914 was Adolf Warchalowski, who worked in Vienna and played a prominent part in the early history of flying in Austria. After graduating in 1909, in October of the same year Adolf Warchalowski was sent to France to collect a Henri Farman biplane, which was ordered by Werner & Pfleiderer, an Austrian engineering concern managed by his older brother August. Receiving the Farman on 20 November, 1909, Adolf made a few ground runs and a short flight, at the end of which the machine was slightly damaged on landing. The biplane was subsequently dismantled and transported to Wiener-Neustadt aerodrome where it was repaired and reassembled by Autoplan-Werke, a newly formed division of the Werner & Pfleiderer company which also acquired the licence for the model. Beginning systematic training on the Farman from Wiener-Neustadt on 24 January, 1910, Adolf Warchalowski soon became the best known and respected pilot in Vienna and achieved one success after another. On 17 February, with a passenger on board, he stayed in the air 25 min 22 sec while circling the aerodrome ten times. As this flight was not observed officially, two days later he repeated the duration attempt, winning the Gerngross Prizes for the first 15-minute and the first passenger-carrying five-minute flights in Austria and establishing the first two officially recognized Austrian national records. On 1 March he stayed in the air for 1 hr 2 min 4 sec, a new Austrian record; on 5 March he won the Austrian Aeroclub Prize for the first 10 km (6.2 mile) cross-country flight; and on 22 April he was granted Austrian Pilot's Certificate No. 1. Upon his return from France Adolf Warchalowski had begun work on his own development of the Henri Farman biplane. Laying the main emphasis on safety and ease of handling rather than on speed, he invented an ingenious landing gear (Austrian Patent No. 50,756) consisting of a system of curved, flexible wooden rods which could absorb very strong impacts without damage, and evolved special flexible Zanonia-shaped wingtips which improved control and stability. These two novel features became the hallmarks of all future Warchalowski System designs, and the landing gear, proving vastly superior to the existing rigid undercarriage designs, was also employed on the Autoplan-built Farmans. At the beginning of 1910 Autoplan-Werke began construction of Pischof's monoplane, which was named the Vindobona I, and two of Warchalowski's biplanes, this latter model being initially referred to as the Vindobona II. The Vindobona biplanes, both powered by 50 hp Gnome seven-cylinder rotary engines driving pusher airscrews, soon became widely known as the Autobiplan Warchalowski System Type I and Type II. On 9 May, 1910, the Type I with Adolf Warchalowski at the controls took-off for the first time from Wiener-Neustadt aerodrome and despite unfavourable weather made three short but completely successful flights that day, thus becoming the first aeroplane designed by a Pole to achieve a sustained and fully controlled flight. The Type II followed it into the air on 29 May, this machine differing from its predecessor in having revised wingtips, modified wings with two narrow bays (instead of a single, wider one) on each side of the fuselage frame to improve the rigidity of the structure, and the new, Warchalowski-designed controls. These comprised a central T-shaped control stick (which operated control surfaces on the wing and elevators) and a normal rudder bar, and replaced the more complicated Farman system employed on the Type I. The machine frequently flew with a detachable, miniature basket-type nacelle which protected the pilot's legs. Various refinements were progressively introduced to both models. Available photographs indicate that the Type I was provided with a single additional interplane strut in the middle of the wing-bay leading edge. This was later supplemented by another interplane strut connecting the rear spars, which complemented the division of the original single bays into two. It appears that both aircraft were subsequently fitted with improved rear fuselage frames and their wingtips and tail surfaces underwent some alterations. In the summer and autumn of 1910 the Warchalowski Types participated in a number of contests and meetings showing remarkably creditable performance. Although at that time Poland was not recognized as a separate state (the southern regions of the partitioned country were incorporated into the Austro-Hungarian Empire), Adolf Warchalowski entered for the great international Budapest Meeting (held 5-17 June, 1910) as the representative of Poland, as recorded in the official competitors list which was published in Fhigsport 1910, No. 10, p. 313. The fact that the holder of the Austrian Pilot's Certificate No. 1 was to appear at Budapest in Polish colours, with all the political implications that entailed, could not have pleased the Austrians. Warchalowski evidently yielded to various pressures, for during the meeting he was officially referred to only as an Austrian. In passing, it is worthy of note that Poles played an important role in the creation of the Austrian flying movement and held several important positions in the Austrian Aeroclub, the Polish influence being reflected by the fact that the Austrian pilots' certificates, printed in six languages, included Polish. During the Budapest Meeting, which attracted 49 contestants, from Austria, France, Germany, Hungary, Italy and Russia, and included such names as Illner, Chavez, Latham and Paulhan, Adolf Warchalowski (Competitor No. 37) flying one of his biplanes (both of which were in Budapest at his disposal) won a number of heats and in the final results gained three third places (for distance, slow-flying and take-off) and one fourth place (for endurance). At the end of the meeting the Grand Duchess Augusta and the Grand Duke Josef of Austria had their first flying experiences as passengers with Adolf Warchalowski on his Autobiplans, and during the following months various members of the Emperor's family and court and other prominent personages were given flights by him. In July 1910, during the Wiener-Neustadt Meetings, Adolf Warchalowski took several prizes, including the first prize for a total endurance of 1 hr 42 min 25 sec; the first prize for a maximum speed of 63.4 km/h (39.49 mph) over a 5 km (3.1 mile) course; the first prize for a passenger flight; and the second prize for greatest height. At the same time his brother Karol, who was learning to fly under Adolf's supervision, mainly on the Type I, distinguished himself in the beginner pilots' class. On 27 July Karol received Austrian Pilot's Certificate No. 8 and four days later won the first prize for a height of 112.71 m (369.78 ft). On Emperor Franz Josefs birthday, 18 August, 1910, Adolf Warchalowski piloting the Type II biplane made an epic flight, the first over the heart of Vienna, which completely captured the imagination of the Austrian public and was widely reported internationally. Taking-off from Wiener-Neustadt after five o'clock in the morning, he rapidly attained a height of 200 m (656 ft) and still climbing headed for the capital city. He was soon over the Imperial castle at Laxenburg and, crossing the Danube, made for the Cathedral of St Stephen which he circled at a height of 700 m (2,296 ft). Then he started off on the journey home, reaching Wiener-Neustadt airfield some 1 1/2 hr after the take-off. During this brilliant cross-country flight, covering some 110 km (68 miles) and completely eclipsing all previous Austrian achievements, Warchalowski bettered a number of existing records, but the lack of approved observers prevented official recognition. He was congratulated by the Emperor and his fine effort was commemorated by a special poster which appeared in the streets of Vienna. At the end of August 1910, Warchalowski re-engined the Type II with the new 65-70 hp Daimler four-cylinder inline water-cooled engine equipped with a direct-drive Lohner airscrew, and his machine became the fastest on the Wiener-Neustadt airfield. The day of the Emperor's review, 18 September, 1910, was of the greatest significance in the history of Austria's fledgling aviation. The Daimler-powered Type II, decorated with trophies received after the famous Vienna flight, was among the 23 machines massed at Wiener-Neustadt for the occasion. During the flying display which followed the review, Warchalowski made a spectacular dash for the height prize and reached an altitude of 460 m (1,509 ft) above the take-off point (742 m = 2,434 ft absolute), which was duly approved as a new national record, and came second in the out-and-return race. In October Adolf Warchalowski demonstrated the Type II in a number of towns including Moravska Ostrava, Opava and Brno. The Type I was destroyed on 8 September, 1910, when Adolf Warchalowski was flying just above it; the aircraft, flown by his brother Karol, was caught in the slipstream of Adolf's aircraft and fell to the ground out of control, seriously injuring its pilot. The Type II came to grief on 10 June, 1911, when its airscrew broke away in flight, injuring Josef Sablatnig, who was flying the machine. Construction: The Autobiplan Warchalowski System Type I and Type II, which in general layout resembled the 1909 Henri Farman model, were two-seat open-frame unstaggered biplanes. The aircraft featured unequal-span wings, with the top plane spanning 11 m (36 ft 1 1/4 in) and the bottom one 8.5 m (27 ft 11 in) in the case of the Type I and 8.8 m (28 ft 10 1/2 in) in the case of the Type II. Except for the flexible Zanonia-shaped upper wingtips, the rearward extensions of which fulfilled the function of ailerons, both wings possessed a constant chord of 2 m (6 ft 7 in). The elevator surface in front of the aircraft had a span of 2.5 m (8 ft 2 3/4 in) and a chord of 1 m (3 ft 3 1/2 in). The lifting tail bay at the rear of the open fuselage frame, with a span of 2.3 m (7 ft 6 3/4 in), consisted of two horizontal surfaces and two rudders. Its top surface (later extended in span to 3.5 m = 11 ft 6 in) was provided with a supplementary elevator which operated in conjunction with the front one. The combined gross area of all lifting surfaces (wings and tail) was 47 sq m (505.9 sq ft). All lifting and control areas were wooden structures covered on both surfaces with rubber-proofed fabric, and the airframe was a composite structure of steel tubing and wooden members, lavishly wire braced. A passenger could be accommodated behind the pilot. Each unit of the patented Warchalowski landing gear, the general principle of which was described earlier, incorporated twin-wheels with a long skid in between. The wheels were attached to the skid with rubber cord so that when they made contact with the ground they drifted back, this having a braking effect. Overall dimensions included a span of 11 m (36 ft 1 1/4 in) and a length of 13.7 m (44 ft 11 1/2 in), while maximum loaded weight was about 450 kg (992 lb). Performance included a maximum speed of about 65 km/h (40.4 mph) and 80 km/h (49.7 mph) for the Gnome- and the Daimler-powered variants respectively. Autobiplan Warchalowski System Type III, Type IV and Type V. From the time the Warchalowski System biplanes first appeared, the military authorities began to show interest in the design, and the Autoplan-Werke were soon given a contract to train the first military pilots. Adolf Warchalowski having overall responsibility for the programme. Realizing that the Army would soon require a machine suitable for its needs, Adolf Warchalowski began work on a more advanced development of his previous models, which, although closely resembling the Type II, was based upon a 65-70 hp Daimler four-cylinder inline water-cooled engine and possessed an improved powerplant installation and control system and a stronger airframe. The new biplane was finished at the end of October 1910. As the official designation of this and the subsequent Warchalowski designs is not clearly apparent from contemporary descriptions, the author decided to continue with the original designation sequence, the new aircraft becoming accordingly the Type III. The last day on which pilots could claim the Lower-Austria Prize for duration and distance flights from Wiener-Neustadt was 31 October, 1910, and both Illner and Adolf Warchalowski took-off for their final attempts to win it. Unfortunately, the Type III, which had not yet been properly tested, developed some control and engine difficulties and Warchalowski was forced to interrupt the flight after 57 min 15 sec. On 9 November the Type III was demonstrated to the Chief of the Imperial General Staff and other high-ranking Austrian officers, and this led to an official contract being placed with Autoplan-Werke for a special Military Type. On 27 December the Type III, flown by Warchalowski with Lieut Aztalos on board, made history by flying for 2 hr 16 min 59 sec. a new officially recognized national duration record. The aeroplane, taking-off with a load of 213 kg (470 lb) (two people and fuel) and covering some 180 km (111.8 miles) at an average speed of some 80 km/h (49.7 mph), beat the previous duration record of Illner, which had been established without a passenger and with a load little more than half of that carried by the Type III. A few days later Adolf Warchalowski was acclaimed the best pilot in Austria in 1910 and awarded the Grunhat Prize. The Warchalowski System Autobiplan Type IV, built to an army specification, was evolved from the Type III. The aircraft, powered by a similar 60 hp Daimler engine, was adapted to carry bigger loads and was provided with a small nacelle protecting the pilot and with wheel-type controls. The Type IV, sometimes officially called the Warchalowski Military Type I, took-off on its first flight on 19 March, 1911, from Wiener-Neustadt airfield with Adolf in the cockpit and that day made seven short flights including one with two passengers. On 1 May, during the official army acceptance trials, the machine, carrying one passenger, remained in the air 2 hr 2 min and reached a height of 380 m (1,246 ft) above the take-off point, the greatest ever reached in Austria with a passenger. The speed test revealed a maximum average speed of 82 km/h (50.9 mph). On 8 May the biplane, which took-off with a load of 300 kg (661 lb), comprising the pilot (Adolf Warchalowski), two officers and fuel, circled in the air for 2 hr 15 min at a height of 300 m (984 ft). With the successful passing of this last, load-carrying and endurance test the Type IV became the first Austrian aeroplane to complete the full official acceptance trials and to enter service with the Army, its performance exceeding all the specified figures. In the spring of 1911 Warchalowski evolved a new biplane, the Type V, powered by a 60 hp Daimler four-cylinder inline water-cooled engine and equipped with wheel-type controls, which was specially adapted for high-performance and competition flying. The machine, sometimes referred to as the Warchalowski Racing Type and the last in the line of his first-generation designs, was a progressive development of the Type IV and, in addition to various other refinements, featured a new streamlined 'racing' nacelle, which was furnished for the first time with a few flight instruments, and a single rudder in the centre of the tail bay (instead of the twin-rudders used on all previous Warchalowski models). At least two Type V biplanes were completed by Autoplan-Werke early in June 1911, the first making its maiden flight on 7 June in the hands of Karol Warchalowski, who, after his accident, had returned to flying two months earlier. Both aeroplanes were ready in time to take part in the first Wiener-Neustadt Meeting of 1911, held 11-18 June, but due to very bad weather conditions the performance achieved was rather disappointing. In the final classification Karol and Adolf on the Type Vs came second and third respectively in the endurance test (Karol's best time being 49 min 14 sec) and in the height test Karol was also placed second. Later the Type V was involved in a number of impressive cross-country flights. On 26 July, 1911, Sablatnig flew one of these aircraft with Hutter as passenger from Wiener-Neustadt to Fischamend (some 45 km = 28 miles) and returned the same evening. On 6 August, he flew with the same passenger to Bruck a/d Leitha and started the return journey on the same day, spending the night in Gramatneusiedl, the total distance covered being some 120 km (75 miles). On 8 August he carried out a passenger out-and-return flight to Neunkirchen and Odenburg. In the evening of the next day Sablatnig's aeroplane, fitted with four headlights (two on the forward elevator outriggers and two on the undercarriage framework), took-off with Sablatnig and Hutter as crew for a night cross-country flight to Fischamend near Vienna, combining with this the first night flight over the capital city. The aircraft reached en route a height of 700 m (2,296 ft), but a strong headwind forced it down, out of fuel, a few miles short of the destination. Refuelled, the night journey was continued, with the landing at Fischamend nine minutes later. The flight back began the same night, Wiener-Neustadt being reached at dawn. Later the Type V was extensively used for the training of military and civil pilots and served in this capacity for some time. Construction: The Autobiplan Warchalowski System Type III, Type IV and Type V were essentially very similar to the previously described Type I and Type II, but, except for the details indicated above, no exact structural and performance data appertaining to these models are available. A machine generally on M. Farman lines, but with different shaped ailerons and corners of the leading edge rounded. An Austrian Biplane over Vienna. 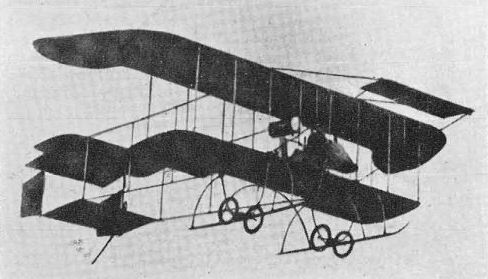 EARLY in the morning of the 18th ult., before the festivities in connection with the Emperor's birthday had begun, Adolf Warchalowski, on a machine which he has designed as the result of his experience with the Henry Farman biplane, succeeded in flying from Wiener-Neustadt to the Austrian capital and back to his starting place. At twenty minutes past five, he rose from the aerodrome, and rapidly attained a height of 200 metres. Still rising, he headed for Vienna, and was soon over the Imperial castle at Laxenburg. Crossing the Danube, he made for the Cathedral of St. Stephen, and at 6.20 made a wide circle round it at a height of 700 metres, and then started off on the journey home, reaching Wiener-Neustadt safely at ten minutes to seven. During the hour and a half he had covered about 110 kiloms., this being the best cross-country flight so far made in Austria, completely eclipsing that made by Illner. The latter, although over a similar course, except that Illner did not fly over the city, was made in two stages. The Warchalowski machine was made at the Autoplan works, which, we understand, also builds the Pischoff monoplane. GOOD progress was made on the opening day of the flying meeting at Wiener Neustadt, which was attended by the Emperor Francis Joseph, the Archduke Leopold-Salvator, Don Jaime de Bourbon, and many other prominent personages. The height prize was won by Warchalowsky with 460 metres, while Illner took the duration prize with 31 mins. 28 secs. Four competed in the cross-country trip from Wiener to Neukeicher and back, a distance of 32 kiloms. The winner was Illner, with 23 mins. 3 secs., Warchalowsky being second, 23 mins. 37 sees. ; Stohaugh, on a Voisin, third in 28 mins. 36 secs. ; and Flesc, also on a Voisin, fourth in 31 mins. 10 secs. 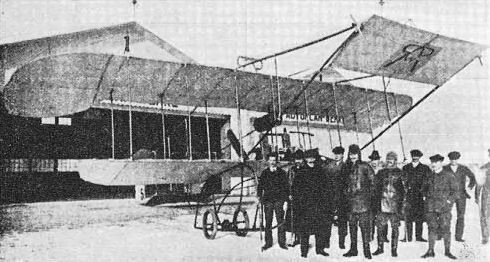 The Vindobona II aeroplanes. The Autobiplan Warchaiowski System Type I, with Karol Warchalowski at the controls, in the foreground and, behind, the Type II, photographed in July 1910 during the Wiener-Neustadt Meeting. Note the single inner interplane struts and differently shaped wingtips of the Type I. The Autobiplan Warchalowski System Type II in its early form and with the miniature basket-tyrpe nacelle attached. Both the Grand Duke and the Grand Duchess Augusta of Austria at Budapest Meeting were taken for flights by Adolf Warchalowski on his biplane. In our picture a general view of the Royal passenger is seen prior to the start. Adolf Warchalowski and his improved, Gnome-powered Type II are greeted and decorated with a laurel wreath upon landing after the historic flight on the day of the Emperor of Austria's birthday over the centre of Vienna on 18 August, 1910. The Autoplan-Werke emblem can be seen on the front elevator and the Austrian national colours on the top wing. The Daimler-powered Warchalowski System Type III, photographed in front of the Autoplan-Werke factory after the establishment of a new national duration record on 27 December, 1910. Adolf Warchalowski and his passenger, Lieut Aztalos, are standing in the middle of the group. 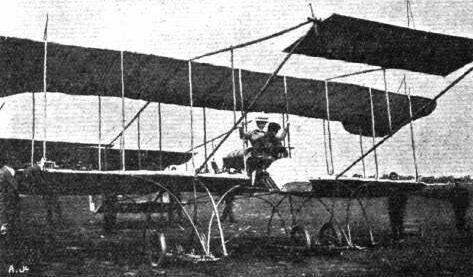 The Warchalowski Military Type I (Warchalowski System Type IV) with Daimler water-cooled inline engine, during its extremely successful flight trials early in the spring of 1911. The Warchalowski Racing Type (Warchalowski System Type V) before the first Wiener-Neustadt Meeting in June 1911. 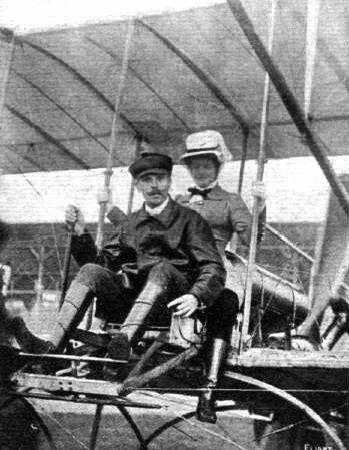 Warchalowski and the Grand Duchess Augusta after the flight at Budapest.